Salt Water Injection Lines — Build 2″ to 20″ piping systems. Natural Gas Field Gathering Lines – Build lines from well to compressor station. Pig Launchers & Receivers – For cleaning water and debris from lines. 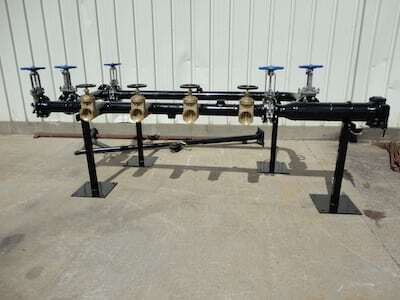 Natural Gas Compressor Stations – Fabricate pipe for compressor stations. Meter Runs – For measuring product on gas and test wells. In addition to building from scratch, we also repair them. We can replace bad sections of lines as needed and/or upgrade complete sections as they become deteriorated. Give us a call and we will come field measure your system, make improvements or changes as requested, fabricate in our shop, and deliver to install on your site. We also sandblast and Carboline coat insides and Primer & Paint outsides to extend the life of the pipe. Adjustable stands are field fabricated to fit your system and the site, increasing system stability and longevity. We are capable of both roll-outs and in-position welds. We have bevel machines from 2″ to 30″. A fleet of welding trucks is available, and enough seasoned welders and helpers to handle most any job. We also have a boom truck and trailers available for removing, delivering & installing your fabricated system. We have established a variety of good relationships with vendors during our 75 years in business, and can locate just about any pipe, fitting or part you would need. Call us for a quote today. We stock a variety of flanges, fittings and pipe, but can also obtain ones we do not keep in a timely fashion. Floyd's Welding Service provides custom piping systems to clients in the oil and gas industries and more to Olney, Vincennes, Effingham, Salem, Fairfield, Louisville, St. Elmo, Griffin, Crossville, and surrounding IL and IN communities.